The duplication of Main South Road between Seaford and Sellicks Beach aims to improve road safety, as well as improve traffic flow and increase capacity. Main South Road has an average traffic of 17,000 vehicles per day, and the duplication will make travelling to, from and within Adelaide’s south safer and easier. 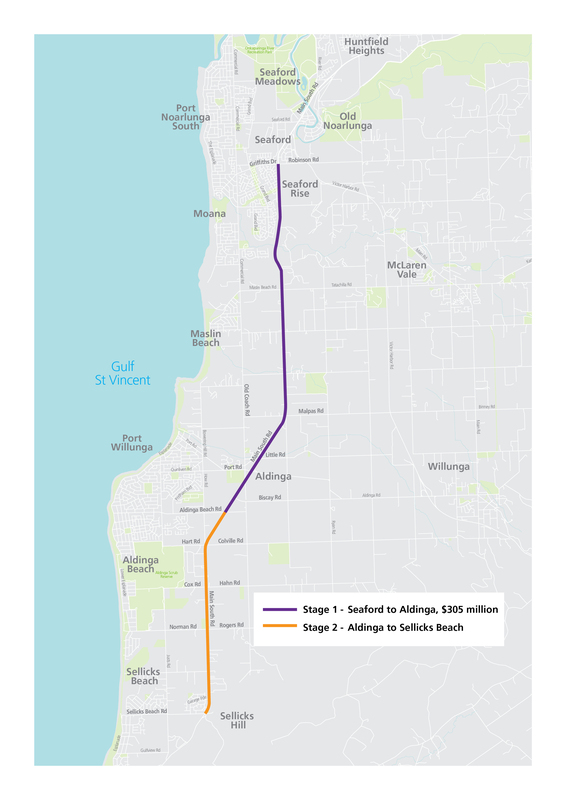 Stage 1 will involve the duplication of approximately 10 kilometres of Main South Road from south of Griffiths Drive in Seaford to Aldinga. This will include the duplication of the Pedler Creek Bridge at Seaford Rise. This stretch of Main South Road was identified as a priority in the State Government’s Integrated Transport and Land Use Plan. The state Government will invest $305 million for stage 1 of the duplication, supporting 165 jobs a year during construction. Stage 2 will continue duplication of Main South Road for approximately 6 kilometres from Aldinga to Sellicks Beach. Construction of stage 1 is expected to start in 2019. Main South Road runs from Old Noarlunga to Cape Jervis and is one of the main traffic corridors to the Fleurieu Peninsula. It is predominantly a two- lane, two-way road traversing rural and semi-urban environments, providing access to southern coastal communities and Kangaroo Island. This road carries significant traffic between Adelaide and the tourist centres to the south and is a major commuter route for the rapidly expanding residential area of Aldinga. The growth in population in this area has been strong, particularly in Seaford and Aldinga. In March 2015, the Department of Planning, Transport and Infrastructure released a finalised Road Management Plan (RMP) for Main South Road. This followed extensive consultation with stakeholders and the community, with the completed RMP identifying a number of opportunities to improve road safety. There has also been an increase in traffic volumes, with the average annual daily traffic volume along Main South Road, between Tatachilla Road and Malpas Road, approximately doubling over the last 13 years from 8,700 in 2002 to 17,300 in 2015. In addition, 78% of crashes on this section of Main South Road occurs at intersections. The traffic volume on this section of Main South Road is expected to continue to grow with several housing and commercial developments under construction and planned in suburbs such as Seaford and Aldinga. An increase in traffic volume presents an increasing road safety risk and longer delays for motorists, and safety for motorists and cyclists will be improved by duplicating Main South Road. The Duplication will also help to grow tourism in the southern region by making the Fleurieu Peninsula and its wine regions, walking trails, restaurants and southern beaches more accessible to tourists, providing for more economic development opportunities. A previously-announced project to improve safety between Old Coach Road and Malpas Road will still go ahead as planned. The duplication of Main South Road in this section will integrate with these works. Detailed designs are being developed and construction of Stage 1 is expected to start in 2019. $305 million has been allocated for Stage 1 of the project.